Whether the wind blows, the ground shakes, the flames rise or snow and water fall from the skies, YOU must be prepared for your pet’s sake! Disasters aren’t always on a regional scale. Power could go out on just your street or in only your building. A tree could fall on your roof or a water pipe could break in your home alone. Even without your neighbors being affected, your household of two-legged, four-legged, feathered, finned or scaled family members could be in distress. If electricity ceases to flow, refrigerated food goes bad, aquarium pumps, filters and heat lamps no longer nourish life; climate control becomes challenging and sometimes deadly. Flooded basements bring disease and ruin while fire can cause ultimate destruction. When disaster strikes, it’s up to YOU to allow it to become a life and death situation or just a major inconvenience. The author clearly lays out steps your pets need YOU to take to be READY, REACT and then RECOVER, but offers suggestions on how to help the humans too. Training, supplies, a positive mental attitude as well as a plan can make all the difference. In addition to well-thought-out preparedness tips for humans and their animal companions, Denise Fleck provides templates for your own family's emergency plan, what to have on hand and skills to possess, suggestions for specific disasters ranging from earthquakes, hurricanes & chemical disasters to tsunamis, power outages and civil unrest. The book concludes with a comprehensive manual covering basic first-aid – should the worst happen – for those who walk on two-legs, four paws or hooves, fly, swim or crawl. 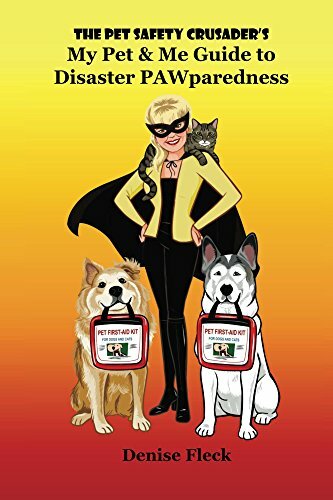 Your pets need YOU to be prepared, and “The Pet Safety Crusader’s My Pet & Me Guide to Disaster PAWparedness” could set you on the path to being ready to handle most any situation that comes your way. You may think you understand all you need to know about pet safety, however, your eyes will be opened after reading "My Pet & Me Guide to Disaster PAWparedness" by Denise Fleck. This is a book to read, relish, and USE! I immediately downloaded a suggested AP on my phone, have printed the cards to carry in my wallet and feel so much better about how my pets will survive during and especially after, a disaster. Denise is an amazing expert on all things pet safety and this volume is her best yet. They say it's not IF a disaster happens, but WHEN - read this book now so you and your pets are safe. I'm so glad I read it and I know you will love it too!